Q: What is the inspiration for your 12×12 piece? Bill Struby: This piece is inspired by the constant storms of the last few years—particularly the hail storms. Q: How do you go about collecting the materials for your collages and mixed media pieces? 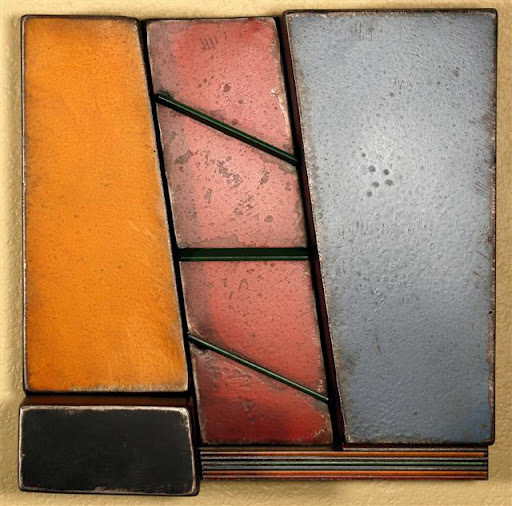 Struby: I have several boxes of images and pieces of color that I have collected over many years. I especially like art magazines for color, and old magazines for what I refer to as “characters.” In the last few years, I’ve found a number of websites that collect old advertising, and that has become a major source. Q: Is there a particular kind of imagery or subject matter you are drawn to more than others? Struby: Because I am usually constructing what I see as a story, I love images that can imply comedy, drama, or mystery. That’s probably why advertising is useful—old advertisements almost always have a storyline. I enjoy taking images from one context and putting them into a new story. I try to keep explanations of my work simple, maybe even sparse, because I don’t want to direct the viewer too much. Even though some of my titles can guide the viewer or provide a starting point, I like the idea of people finding their meaning, or additional meanings. View and bid on this artwork as part of the 12×12 Art Fundraiser tonight along with food, fun and 149 other artists. Preview the artwork for the one-night event and purchase tickets here: www.12x12okc.org. Q: Has your childhood been a big influence on your work? If so, please explain. Becky Way: My second (or third) childhood has been a larger influence in my work than actual childhood. I did draw a lot as a child, with everything and ON everything I could get my hands on. Q: Do you have a favorite location or object to use for subject matter in your work? BW: I like still life objects because they don’t move, the light stays the same, and there are no bugs involved. I do like to draw outside and take photos to turn into abstract landscapes in the studio. For fun, I love to fill sketchbooks with drawings and sketches of people and animals. Q: What is your best piece of advice for an emerging artist? BW: Learn to draw. Study with teachers whose work you admire. Read books written by artists you admire. But above all, learn to draw, because drawing isn’t learning how to coordinate your hand and eye, but is rather learning how to see. If you can see well, it will translate into your painting. 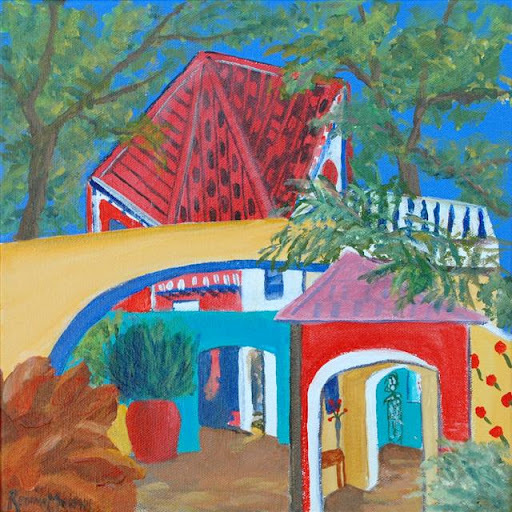 View and bid on this artwork as part of the 12×12 Art Fundraiser on September 28, 2012 along with food, fun and 149 other artists. Preview the artwork for the one-night event and purchase tickets here: www.12x12okc.org. Q: Can you describe the process in creating your 12×12 piece? 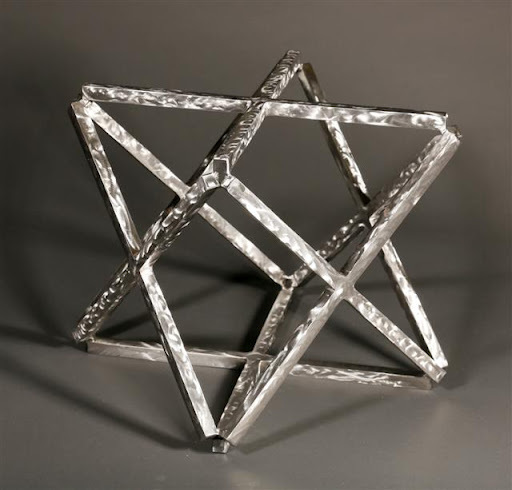 Owen: I am utilizing the cubic space of 12″ X 12″ to create a steel sculpture. The process involves cutting steel rods, grinding, polishing and welding. From start to finish it takes about 35 hours. Q: What was the inspiration for this work? Owen: I was inspired by the 12″ x 12″ dimensions and how that space could become a simplistic yet dynamic optical illusion. Q: Is there a particular medium you are currently drawn to? Owen: Steel. It is a powerful, energetic and durable medium. Working with steel is a primal activity. The physicality of the labor involved makes me feel balanced. 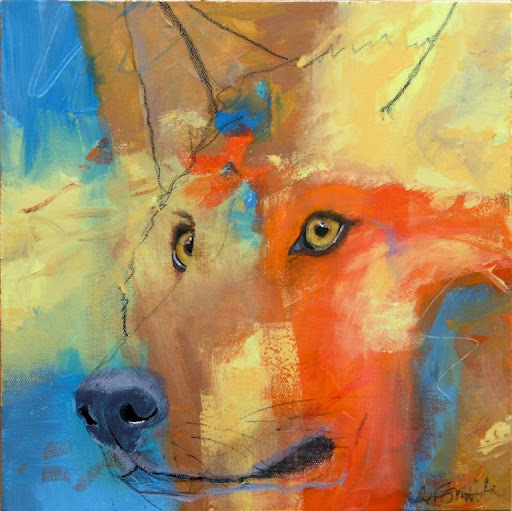 Diana Smith: I have chosen a very warm, but bright palette, reminding me of the colors of the New Mexico landscape then interjected the wild wolf into this landscape. My vision is to create a pleasant, comforting place, while portraying the dignity and presence of the canine. 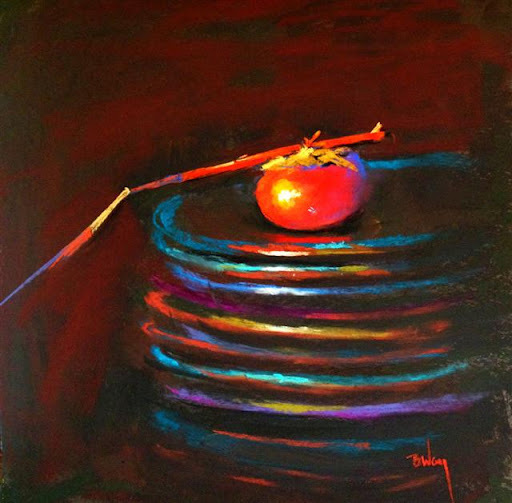 Q: As a mixed media artist, is there a particular medium you prefer above the others? DS: This new body of work feels like a cleansing. 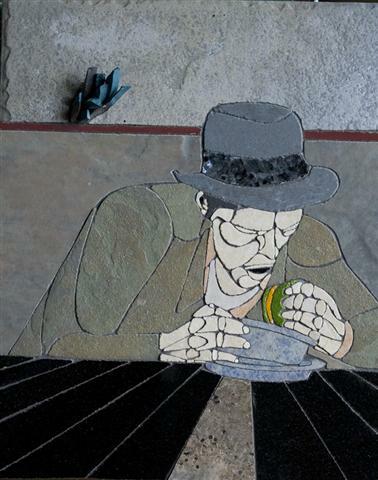 I have put aside collage and mixed media which were incorporated in my work for years. Now I’m concentrating on paint, only including a few lines of suggestion with charcoal. I am delving back into abstract composition, where my formal training began, and adding just a touch of figurative. Q: How did you execute your work for 12×12 technically? Garrett: start with leftover pieces of flat metal and find pieces that will form the overall shape that I have in mind. I weld sides of different heights on the individual pieces and then polish all the edges smooth. Color is added in layers and then goes through an aging process. The pieces are now welded together to form the finished work. Q: Are you drawn to any particular shape, form, or color? Q: From where do you gather materials for your mosaic pieces? Q:Where else can audiences view your artwork? BT: Well, my work is a part of the columbarium and courtyard project at St. Paul’s Episcopal Cathedral on NW 7th and Robinson here in OKC. I did have an exhibition down at the Leslie Powell Gallery in Lawton this past January, but since then, and for a couple of years now, I have not been exhibiting my gallery work locally, due to the imminent invasion of giant lizard creatures from space. Of course, there’s always my website, and if people know the password, they could see selected pieces at my house. Q: Where do you draw the inspiration from for the landscapes in your work? Are the places imagined or actual? Regina Murphy: Many places are actual, some are imagined, and some are a combination of both. Q: You have been in the art world for a long time and explored many techniques and mediums. Is there a certain one that you always fall back on? RM: I always return to acrylics because of the fast drying nature of the medium. I am a very impatient person and paint rather fast, so acrylics seem to fit me best, although I still love oils and often revisit them. Do you ever get stuck in a rut? What do you do? RM: Yes. When that happens I just keep painting but the work turns out badly. Then, finally I get a new inspiration and go on from there.